"Palm Study 2 (9.1.18)", 75x75cm, oil on canvas. “Woodleys Marina, Berry’s Bay (9.2.17) - Plein Air”, 60x75cm, oil on canvas. 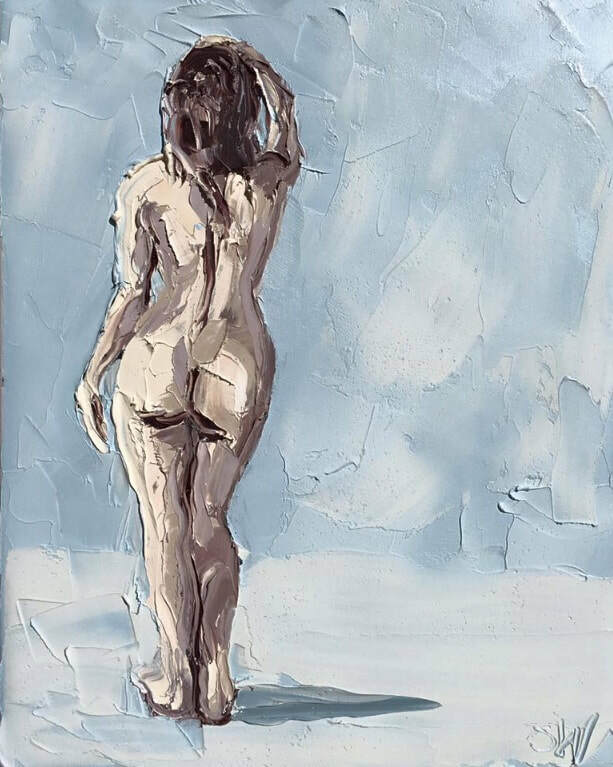 ​Sally West has been painting and drawing all her life. ​It is and has always been her preferred language. Having grown up on a sheep and wheat farm in central NSW of Australia, Sally was isolated as a child but strongly connected to nature. During primary school Sally was shy and she discovered a silent voice in drawing. On completion of school, Sally travelled for many years exploring a variety of cultures. This gave her the inspiration and confidence to pursue art as a career. Sally returned to Australia and embarked on further studies, with a deep commitment to pursue her dream to be an artist. Sally’s first major solo exhibition was in 1998 at the Bondi Pavillion. This was well received, launching her career as a serious artist. Sally has since exhibited all over the world, including New York, London, Paris, Hong Kong and other major cities. With numerous major Australian and International Art Prizes to her name, Sally’s work can now be found in private collections all over the world. “Pittwater (18.9.17) - Plein Air”, 120x150cm, oil on canvas. “Onshore, 2-3 Foot - Beach Study 3 (22.12.17) - Plein Air”, 40x50cm, oil on canvas. “Fresh Onshore - Beach Study (21.9.17) - Plein Air”, 45x45cm, oil on canvas. “25 And Mostly Sunny - Beach Study 3 (24.4.17) - Plein Air”, 40x50cm, oil on canvas. “Pittwater Study 2 (18.9.17) - Plein Air”, 22x5x25.2cm, oil on oil paper. "Harbour Heatwave (22.11.16) - Plein Air", 100x150cm, oil on canvas. “Monday’s Low Tide - Beach Study 2 (27.3.17) - Plein Air”, 45x45cm, oil on canvas. "Road Runner Study 1 (28.8.17)", 40x50cm, oil on canvas. "Yellow Van", 120x150cm, oil on canvas. WINNER 2017 Cliftons Art Prize, Sydney Section. “The Freightliner - Plein Air”, 120x150cm, oil on canvas. 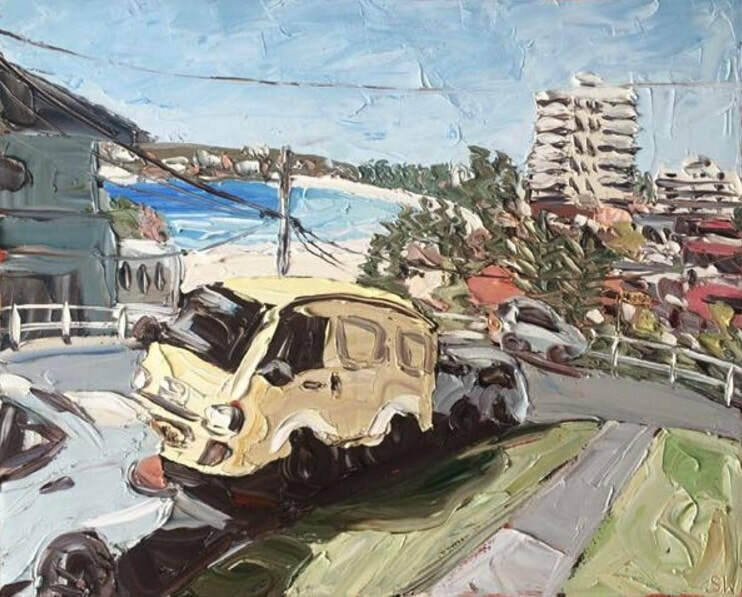 “Ben Buckler, Bondi - Plein Air”, 75x100cm, oil on canvas. “Hymix”, 120x150cm, oil on canvas. "Emma", 40x50cm, oil on canvas.